Ebenezer Thompson was born in West Haven, Connecticut, in 1712. He graduated from Yale College in 1733, married the following March, and then did what Yale graduates weren’t supposed to do: start worshipping in the Church of England. In fact, in 1743 Thompson took holy orders in England, becoming an ordained Anglican minister. At that time the Church of England considered most of New England to be missionary territory, hostile or indifferent to the established denomination. The Society for the Propagation of the Gospel in Foreign Parts (seal shown here) paid ministers to take posts there since the congregations were too small to support them. The S.P.G. sent Thompson to Scituate, Massachusetts, at the end of 1743 with a salary of £40 per year. His job was not only to serve Anglicans in that town, where St. Andrew’s Church had been built in 1731, but also to proselytize in the neighboring towns. I beg leave to acquaint the Venerable Society that by the blessing of God on my sincere Endeavours, the Church of England continues to increase in these parts, and people in general begin to conceive a much better opinion of it than they had when I first came here. The good people of Marshfield have so far finished the new Church that on Sunday the 18th of September last, I preached in it to a large Congregation and administered the Sacrament of the Lord’s Supper to 18 regular Communicants. I hope the Honorable Society will be pleased to favour this new Church with a Bible and Prayer Book. By 1754 Thompson was preaching “once a Month to the New Church at Marshfield, where, and at his own Church of Scituate he has the Pleasure to see the neigbouring Indians come frequently to Church.” Four years later the S.P.G. understood his three churches “at Scituate, Marshfield, and Bridgewater” to be “in a flourishing and encreasing State.” He received a raise to £50 per year. In March 1760 Thompson reported that his three congregations “live among themselves and with the Dissenters their Neighbours in Friendship and Love; some of whom, of various Denominations, observing the Order and Regularity of our Church, begin to have a much better Opinion thereof than heretofore.” As of 1763 he counted “700 Families of various Persuasions” in those towns, “50 of which profess themselves of the Church of England, and attend the publick Worship with Seriousness, Decency and Devotion.” He had forty-seven white communicants and three Indians, and preached once every five weeks in Marshfield. Thompson’s Anglican community continued to grow through conversions. In 1771 the minister wrote, “there has been added to the Church four families of good reputation from among the Dissenters.” In 1774 the S.P.G. understood, “The Rev. Mr. Thompson's congregation at Scituate and Marshfield have received an addition of 8 families from the Dissenters.” The Anglican communicants were up to 57 people in 1774, the year that Marshfield had its open political split. Clearly most of Thompson’s adherents were in Scituate, but it appears some of the most prominent were in Marshfield. Without surviving church records, I can’t say for sure which of Marshfield’s political leaders became Anglican. Cynthia Hagar Krusell’s 1976 pamphlet Of Tea and Tories says the White and Little families did, and Loyalist leader Nathaniel Ray Thomas was definitely C. of E. after he settled in Nova Scotia in 1776. In the early 1770s the S.P.G. reported, “The Rev. Mr. Thompson Missionary at Scituate and Marshfield, informs the Society that there is more harmony than formerly between his People and the Dissenters.” But that denominational difference was probably significant in the split of 1774. The Anglican ministers of New England were among the strongest proponents of remaining loyal to the government of the king, who was also the head of their church. Thompson’s work was a likely factor in how Marshfield had more Loyalists, and more fervent Loyalists, than nearby towns—even Scituate. He continued firm to his principles to the last. In the support of them, and of his duty to the Church, he met with some harsh treatment, under which he gave substantial evidence of a truly Christian temper, as he also did under a long and painful exercise from bodily infirmities. The Rev. Dr. Henry Caner of Boston’s King’s Chapel wrote, “It is said that his death was partly owing to bodily disorder, and partly to some uncivil treatment from the rebels in his neighbourhood.” An 1899 book went further: “Being a Royalist he felt it imperative upon him, during the Revolution, to continue praying for the King and was imprisoned therefor, dying from the accompanying exposure.” That was too far, in fact—there are no records of Thompson’s imprisonment. But political stress probably contributed to Thompson’s death at sixty-three. Thompson’s widow stayed in Scituate and died there in 1813 at the age of ninety-nine. After 1775 the Anglican church in Marshfield lacked both a minister and enough parishioners to remain open. Not until decades later did Trinity Church have a significant presence in the town again. TOMORROW: A child’s view of Marshfield’s Revolution. 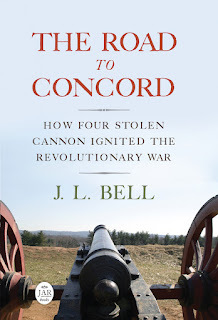 Great series on the Marshfield Loyalists! Since Henry VIII, the king of England has been the official head of the Church of England. So indeed, ministers in that church had an extra tie of loyalty to the Crown.